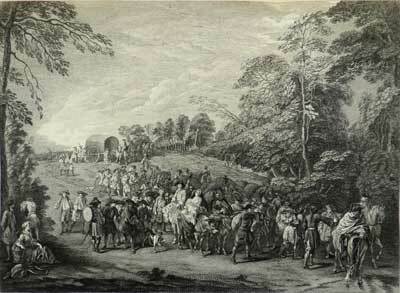 Charles Nicholas Cochin after Watteau, Camp volant, 1727, engraving. 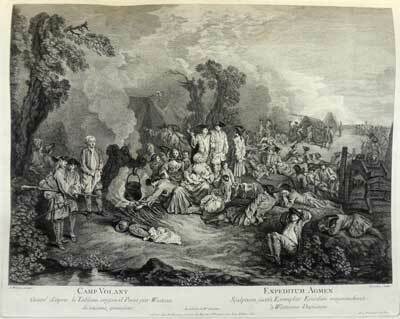 Watteau’s Camp volant was engraved in reverse by Charles Nicolas Cochin and was announced for sale in the December 1727 issue of the Mercure (p. 2677). Paris, collection of Pierre Sirois (1665-1726; art dealer). Sirois paid Watteau 200 livres. Paris, collection of Edme Gersaint. This provenance is specified in the engraving’s caption: “du Cabinet de M Gersaint.” The change of ownership from Sirois to Gersaint is undoubtedly due, at least in part, to the 1718 marriage of Sirois’ oldest daughter, Marie Louise, to Gersaint. St. Petersburg, collection of Czar Nicholas II (1868-1918). Transferred to the Hermitage Museum after the Revolution. Transferred to the Pushkin State Museum of Fine Arts in 1928. Paris, Palais national, Chefs-d’oeuvre (1937), cat. 227 (by Watteau, Le Camp volant, lent by Moscou Musée des beaux-arts). Moscow, Pushkin Museum, French Art of the 15th-20th Centuries (1955), p. 24. Leningrad, Hermitage, L’Art français (1955), p. 12. Bordeaux, Musée, Chefs-d’oeuvre (1965), cat. 42 (by Watteau, Le Camp volant, lent by Musée Pouchkine, Moscou). Paris, Chefs d’oeuvre (1965-66), cat 40 (by Watteau, Le Camp Volant, lent by Musée Pouchkine, Moscou). Washington, Paris, Berlin, Watteau 1684-1721 (1984), cat. P6 (by Watteau, Bivouac, lent by the Pushkin Museum of Fine Arts, Moscow. Hédouin, ”Watteau” (1845), cat. 81. Hédouin, Mosaïque (1856), cat. 82. Goncourt, L’Art au XVIIIème siècle (1860), 56. Goncourt, Catalogue raisonné (1875), cat. 52. Pilon, Watteau et son école (1912), 21, 32, 49, 120. Zimmermann, Watteau (1912), pl. 4. Dacier, Vuaflart, and Hérold, Jean de Jullienne et les graveurs (1921-29), cat. 148. Réau, “Watteau” (1928), cat. 28. Adhémar, Watteau (1950), cat. 37. Cailleux, “Four Studies of Soldiers” (1959), iii, v, vii. Macchia and Montagni, L’opera completa di Watteau (1968), cat. 44. Ferré, Watteau (1972), cat. A1. Roland Michel, Watteau (1984), 33, 38, 69, 168-69, 211, 214-15, 229. Posner, Watteau (1984), 18, 31, 33-34, 40, 53, 65. Zolotov, Watteau, Peintures et dessins (1985), cat. 17-21. Rosenberg and Prat, Watteau, Catalogue raisonné des dessins (1996), cat. 64-66. Zolotov, Watteau (1996), cat. 7. Temperini, Watteau (2002), cat. 13. Wile, Watteau’s Soldiers (2016), cat. 9, 10, 14, 44. Of the fifteen principal figures in Le Camp volant, only a few can be traced to Watteau’s studies from the model. 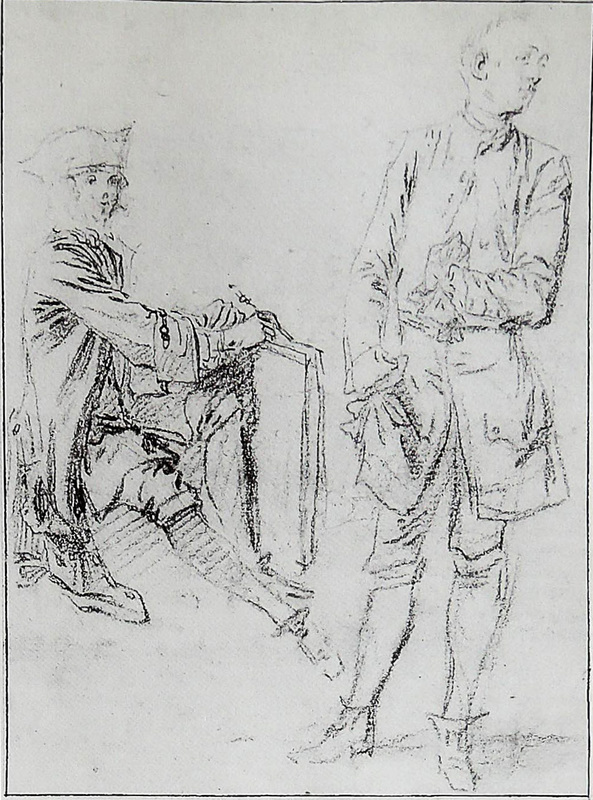 This is a good indication of how few of his early drawings, especially his studies of soldiers, have survived. Watteau, Study of a Cook, red chalk, 12 x 5 cm. Paris, private collection. Watteau, Studies of a Standing Man and a Seated Man with a Portfolio, red chalk, 12.4 x 9.2 cm. Private collection. Two of the soldiers—a soldier standing at the center of the painting, his hand tucked into his jacket, and the cook at the right side, wiping his hands on his apron—were derived from what was once a single sheet of studies. That sheet, however, was cut down into two parts: the cook in one section (Rosenberg and Prat 64) and the soldier with his hand in his jacket in the other (Rosenberg and Prat 65). The original aspect of the whole sheet is recorded in a counterproof acquired by Tessin in 1715 and that is now in the Stockholm Nationalmuseum. 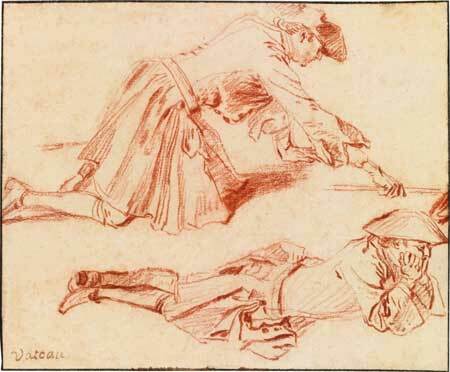 Watteau, Study of Two Men Posed on the Ground, red chalk, 12.3 x 15.3 cm. Whereabouts unknown. 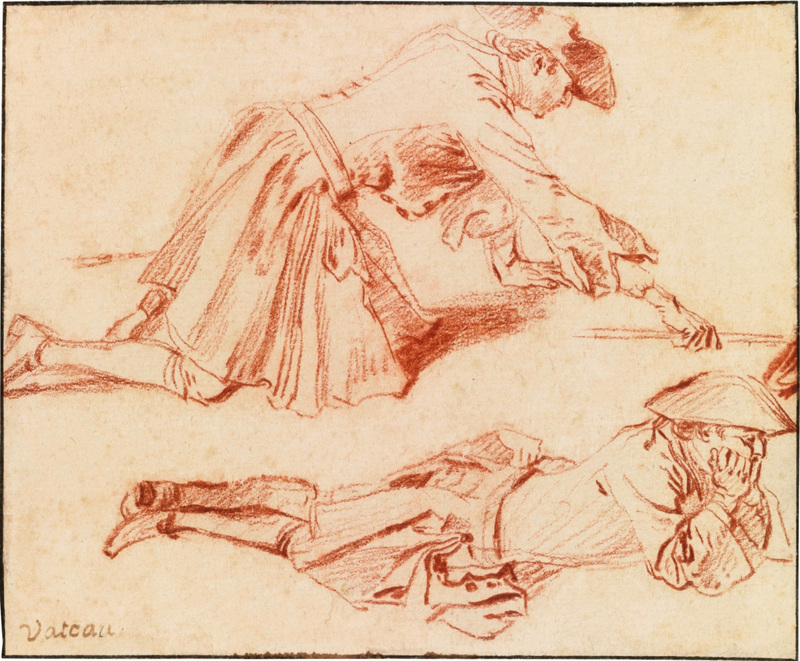 Watteau borrowed two figures from another single sheet: a man kneeling on the ground and the same man reclining on his stomach, his head resting on his hands (Rosenberg and Prat 66). 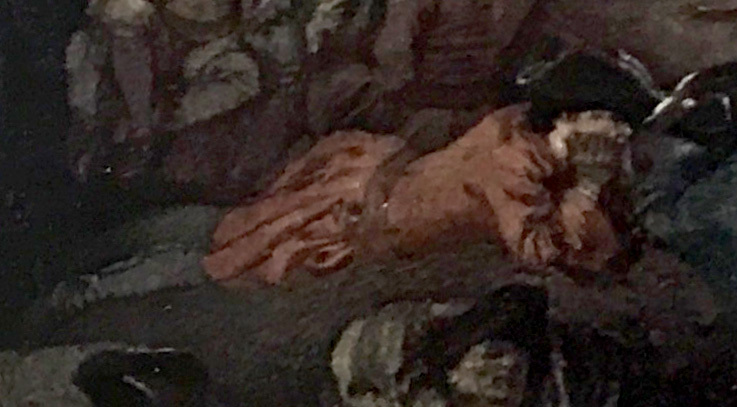 The first of these studies was used for the man preparing the fire under the cauldron, and the second was used for one of the resting soldiers at the left side of the painting. The efficiency with which Watteau worked is remarkable. Not only did he take several figures from each sheet but, moreover, he used sheets that were probably in close proximity to each other. Both sheets under consideration here measure approximately 12 cm in height and approximately 15 cm in width, suggesting that they were part of the same folio. Charles Nicolas Cochin after Watteau, Retour de la campagne, engraving (here reversed to the orientation of the original painting). 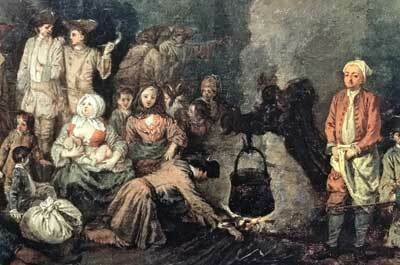 Quite exceptionally, the histories of the origin of this painting and its pendant, Retour de la campagne, are known. 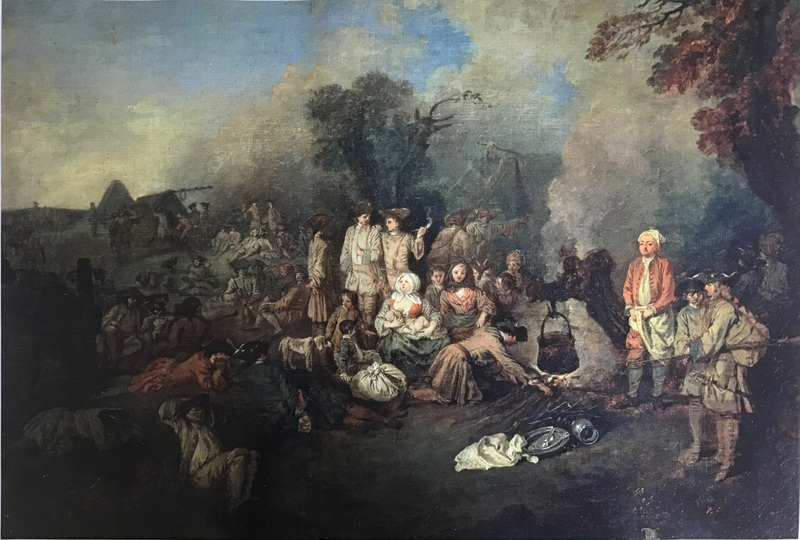 According to Gersaint, Watteau painted a Departure of Troops in his spare time, and he showed it to his master, Claude Audran, who was astounded at its merit. At the suggestion of Jean Jacques Spoede, an artist whom Watteau seems to have known from Gillot’s studio, he showed it to the art dealer Sirois, who bought it for sixty livres, with the understanding that Watteau would paint a pendant. This was a sufficient amount of money to allow the artist to travel home to Valenciennes. Watteau received a passport to travel northward in September 1710, and since the passport was valid for only one month, this fixes the time period quite precisely. Presumably he painted the pendant picture once he arrived in his natal town. The theme of the Retour de la campagne emphasizes the movement of troops, and would thus correspond to the first painting sold to Sirois. By contrast, Le Camp volant displays the troops at rest, and would thus be the second painting that Watteau created for Sirois. Gersaint noted that the two pendants were later engraved by Cochin, and this too corresponds to the paintings under discussion. A striking aspect of these pendants is the large number of figures and, as a result, their small scale in relation to the whole of the composition. This same approach is seen in many of Watteau’s early fêtes galantes, such as the Comédiens sur le champ de foire in Berlin and the Mariée de village in the Sir John Soane’s Museum, London. These crowd scenes constituted an important tradition in Flemish genre painting where the price was tallied in accord with the number of figures portrayed. Connoisseurs and dealers vaunted the skill of the painter in executing such tours de force. Later, Watteau would favor compositions with fewer but more monumental figures, such as L’Alte and La Partie quarré. This picture and its pendant were still in Paris in 1727 when they were engraved, but their later whereabouts are unknown. It is believed that Camp volant entered the Russian royal collection well before the accession of Czar Nicolas II in 1894, but it was acknowledged for the first time only the following year in Somov’s catalogue of the Hermitage. Where was this picture between 1727 and 1895? 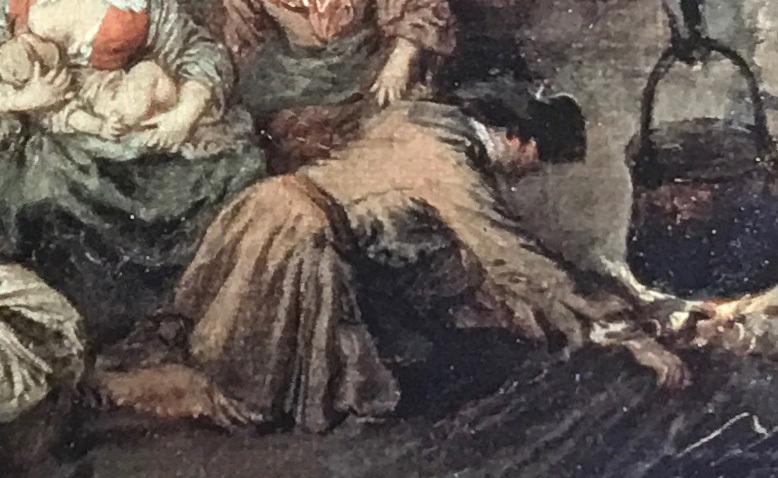 Dacier, Vuaflart, and Hérold, wrongly believing that the picture in Russia was not autograph, proposed that Watteau’s original painting was the one sold in Paris in 1847 (our copy 4). Subsequently all other critics have accepted the Russian version as the original, but this still leaves open where the painting was in the late eighteenth and nineteenth centuries. In 1984 Rosenberg again wondered whether this painting was not the one in the Paris 1847 sale, but the measurements and medium of that painting (and its pendant) are unknown, and thus the evidence is too skimpy. The paintings sold in 1847 could well have been any of the other copies that have come down to us. There is a curious discrepancy between the Moscow painting and Cochin's engraving in the forms of the trees at the right: in the painting it is a leafy bower whereas in the engraving it is a more distinctive gnarled trunk with a few sparse branches. This suggests that the painting, like others in Russia, may have been "restored" injudiciously.